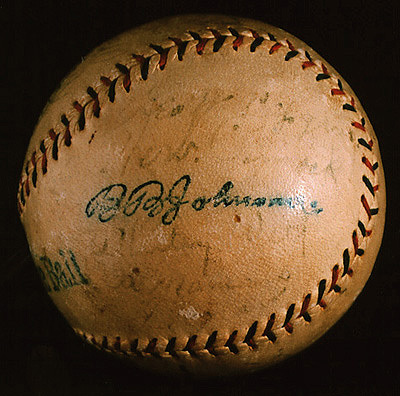 Ball type: Reach Official American League, double stitched, Ban Johnson signature (front panel). Signatures: Sixteen, in fountain pen. Back panel (sweet spot): Babe Ruth. Upper panel: Miller Huggins, Wally Schang, Sam Jones, Mike McNally, Bob Meusel. Right side panel: George Pipgras, Herb Pennock, Whitey Witt, Al Mamaux, [?]. Lower panel: Joe Bush, Waite Hoyt, Aaron Ward, Bob Shawkey, Fred Hofmann. Left side panel: Wally Pipp, [? ], [? ], [? ], [? ], [?]. Condition: Sixteen of a probable twenty-two signatures decipherable. Those on the back and upper panels fully discernable, with significant fading. Those on the lower and right side panels decipherable (with one exception) though not fully discernable, with very significant fading. Left side panel signatures are, with one exception, indecipherable due to fading. Ball shows moderate and even natural discoloration. Notes: In the winter of 1923-24 the New York Yankees were newly recognized as baseball's premier franchise. And indeed, everything about the team seemed a superlative. On the field, the Yankees were fresh from their first World Series victory, a convincing defeat of their bitter rivals, the New York Giants. Brewer / realtor Jacob Ruppert, Jr. was the majors' wealthiest owner, and had spent unprecedented sums strengthening a historically weak franchise. The Yankees played in the nation's biggest market, in baseball's newest and grandest playing facility (Yankee Stadium, completed in 1923), before the game's largest crowds. And in outfielder Babe Ruth, Ruppert had both a player of unrivalled ability and a gate attraction unmatched in the history of American spectator sports. Given all this, it is scarcely surprising that the Yanks were odds-on favorites to win a fourth consecutive American League pennant in 1924. As it happened, they failed to do so, due partly to a weakened pitching staff, partly to the unexpectedly fine play of the Washington Nationals, and partly to a lack of discipline fueled by Ruth's notorious disregard for authority, especially the authority of manager Miller Huggins. These internal problems came to a head the following season, when years of excess broke down Ruth's health and his continued defiance of Huggins resulted in a $5000 fine and suspension. Still, the 1924 Yankees had the talent to compete. They were in first place for much of the season, but fell behind Washington in late August and were never able to regain the lead, despite a close September race in which the teams were seldom separated by more than two games. The Yanks were eliminated on 29 September, and finished the year at 89-63, two games back. The team itself was a veteran one: it had been built by Ruppert and business manager Ed Barrow through a series of one-sided trades and cash transactions with Harry Frazee, the financially strapped owner of the Boston Red Sox. Of the thirteen chief contributors to the 1924 Yankees, no fewer than eight had been acquired from Boston; only outfielder Bob Meusel and second baseman Aaron Ward had made their major league debuts with New York. This, however, would soon change: recent Yankee recruits and future Hall-of-Famers Lou Gehrig and Earle Combs each played briefly with the 1924 club, and each would become a starter in 1925. On the field, Ruth was once again superb. Nineteen twenty-four is not remembered as one of his "career" years, yet it arguably ranks among the ten best seasons a hitter has ever had: such is his statistical dominance. He led the league in batting (.378), runs (143), homers (46), walks (142), on-base percentage (.513) and slugging percentage (.739); the latter two figures rank tenth and ninth all-time, respectively (and fourth and fifth among Ruth's own seasonal figures). 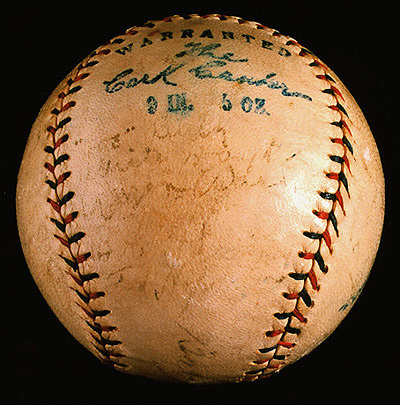 The signatures of most of the 1924 Yankees' key performers are decipherable on this ball. They include starting infielders Wally Pipp and Aaron Ward, the outfield of Meusel, Whitey Witt, and Ruth, catcher Wally Schang, and the five chief pitchers: Pennock, Hoyt, Bush, Shawkey, and Jones. 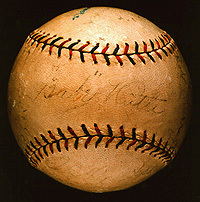 Also present is Miller Huggins - though Ruth's signature occupies the "sweet spot," traditionally reserved for the manager. 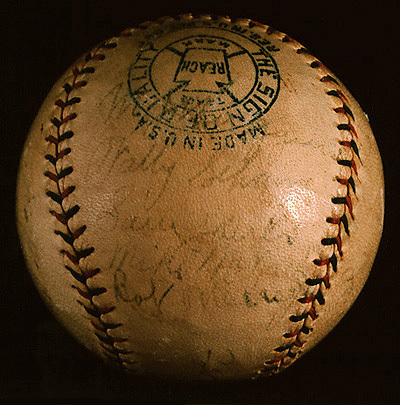 The ball was necessarily signed in August or September, after veteran pitcher Al Mamaux was purchased from Reading of the International League (Mamaux was with the Yankees only in 1924; his presence is the most compelling evidence as to date). 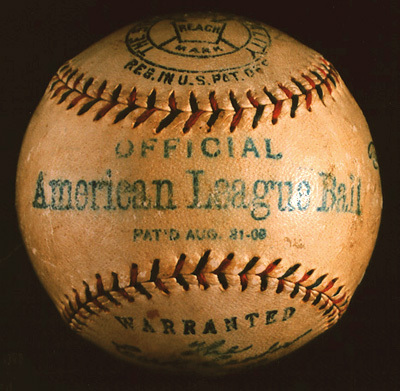 The ball was formerly the property of the family of Johnny Evers, who presumably acquired it on the occasion of a Yankees-Chicago White Sox series (Evers was Chicago manager in 1924). 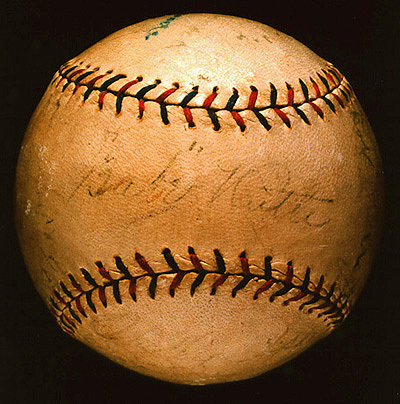 Decipherable Hall-of-Fame signatures on the ball include Ruth, Pennock, Hoyt, and Huggins. Provenance: Gift of John J. Evers, Jr.